Talented British musician, Adele Laurie Blue Adkins MBE enters the Forbes World's Wealthiest Celebrities List of 2016 at an impressive number 9, with earnings of $80.5 Million pretax. The 28 year old singer songwriter hails from Tottenham, London and graduated from the BRIT School for Performing Arts and Technology in 2006. Her debut album, 19 was released in 2008 to commercial and critical success. Adele's follow up studio album, 21 and third, 25 were also best selling. Her music has been nominated for and received numerous awards including Grammys, Brits, a Golden Globe and an Academy Award. She is also the first woman in the history of the Billboard Hot 100 to have three simultaneous top 10 singles as a lead artist, and the first female artist to simultaneously have two albums in the top five of the Billboard 200 and two singles in the top five of the Billboard Hot 100. Very impressive! So we know Adele is a very successful singer songwriter but the main focus of this article is on her nutrition habits. This article is the 9th edition in the YouRCooK Series on the Nutrition Habits of the 100 Wealthiest Celebrities of 2016. Of course I cannot claim that every word written about each celebrity's nutrition is 100 percent correct because the accuracy of the information is only as valid as the original data source. I will make every effort to contact each celebrity on the list or their representative to find out about their general nutrition habits but I'm a realist and they are unlikely to respond to my request. So until they do, you will have to make do with my less than perfect sleuthing skills to ascertain this information. So I will continue with writing about celebrities' nutrition habits in order to see whether there is a link between earning alot of money and following a particular food plan. There is a link between wealthy athletes and good nutrition habits as naturally due to their profession, these individuals have to ensure what they consume his optimum in nature but dos this connection also extend to wealthy celebrities in other professions? Only time will tell as this YouRCooK study continues and the more celebrity diets I explore, I presume the better a conclusion I can make as to whether financial wealth and nutritional wealth are interlinked. With a quick google search I found this Guardian article from 2008 (8 years ago) where Dr John Briffa looked at Adele's diet and it was revealed that she doesn't eat bad food but just eats large quantities of food. Of course this nutrition information is out of date but I will also see if more recent articles discuss Adele's nutrition habits. She also declared that she never ate breakfast because she doesn't feel like eating when she wakes up, so she will just have a cup of PG Tips tea with two white sugars and semi-skimmed milk. If she does have breakfast, it would be a big fry-up but with tinned and not fresh tomatoes because she is allergic to the seeds. Apparently they make her lips swell. Adele went on to say that she will have a tuna mayonaise sandwich for lunch on thick white crusty bread and a cup of tea and a custard cream or sometimes a jammy dodger. She loves her Mum's cooking and one of her favourite dishes is chilli con carne made with chocolate. Adele also loved spicy food according to the article. 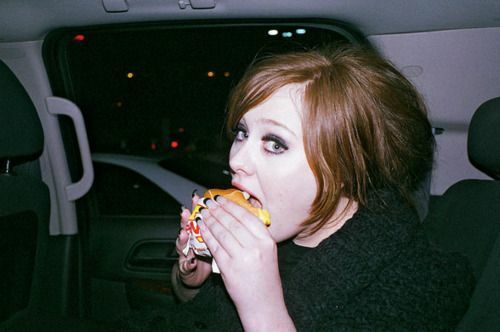 When touring America, Adele found it hard to eat well and resorted to eating a lot of fries. She liked grapes and did not have citrus fruits in order to protect her voice. She consumed a limited amount of dairy, mainly milk in tea. Adele liked to treat herself to strawberry milkshakes but due to the calorie/fat content she stopped having them. Adele also talked about a chocolate cake from tesco being one of her favourite treats. In 2011, Adele said she likes eating fine foods and consuming nice wine and earlier this year, Adele interrupted her gig at London's O2 arena to declare the urge to eat from the American takeaway fast food chain Five Guys. I have attempted to look at Adele's dietary habits but most of the information was sourced from a 2008 article so it is unlikely she still eats similar things now. If I were to explore the link between monetary wealth and nutritional wealth based on Adele's 2008 nutrition habits, I would say that there was not necessarily a correlation in her case. Find out who will grace the YouRCooK blog page tomorrow with their nutrition habits. I've decided not to look at the top 100 Wealthiest Celebrities of 2016 in chronological order any longer but to leave you guessing as to who the next one will be. If you are looking for a healthy meal delivery company to provide you with nutritious meals, go ahead and check out our YouRCooK meal prep and meal kit comparison tool at www.your-cook.com/retailers. There you can find healthy meal prep providers that can supply you with food plans to suit your nutrition, budget and location requirements. Currently we have healthy meal prep companies from over 30 countries. The number of countries represented and business listings are increasing daily. There is so much choice out there.